The Volkswagen Transporter is a well-known and well-loved panel van. It’s one of the nation’s favourite and is a great alternative against the Ford Transit. Available to lease today through our short term lease contract. 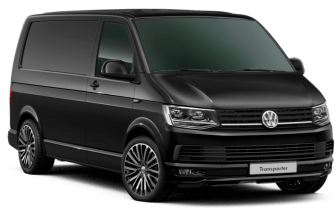 Despite the Transporter being a full commercial vehicle, it’s still built to the same incredible quality seen within other VW passenger cars. This van is comfortable to drive and is actually fairly economical to run. It’s the perfect choice for companies and or professional individuals, looking for a van to cover the gap between 1 to 6 months. Our lease offer is based on the short wheel base (SWB), low roof model. Which sees the length of the van to just under 5 metres (4,904mm) and has a height of 1,990mm. The load compartment inside has a volume of 5.8m³ and up to 1,301kg payload. The low loading bed and a huge rear opening (1,473mm) also makes loading/unloading remarkably easy. Available only with a manual transmission, our vans are equipped with a 2.0TDi 102ps diesel engine. With a 47 MPG (combined.) rating and a 70-litre fuel tank. This van performs well on fuel economy. Bluetooth® phone connectivity with trip computer and multi-function display plus. CD drive, SD card slot, AUX-IN socket and four speakers.